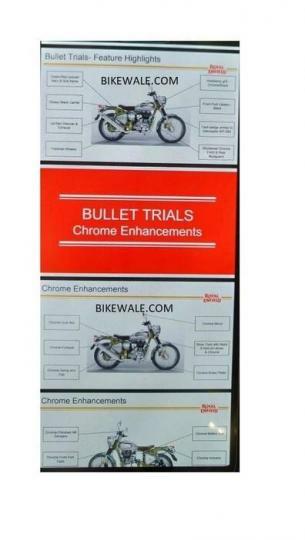 The first images of the Royal Enfield Bullet Trials had leaked online in January, 2019. Now, more details of the upcoming models have emerged. According to a media report, the Trials models are likely to be offered with optional accessories such as handlebar brace kit, rear seat cover, touring seats and engine guards. According to a leaked image, the Trials models are likely to feature certain aesthetic updates over the standard bike. These include red or green painted frame, chrome front and rear mudguards, chrome battery box and rear-view mirrors, polished wheels and circular headlamp with either chrome or black bezel. One of the key differentiating features of the Bullet Trials is its upswept exhaust. It has conventional telescopic suspension at the front with rubber gaiters and twin shock absorbers at the rear. Royal Enfield is expected to offer the Bullet Trials with a 346cc, single-cylinder engine that produces 19.8 BHP and 28 Nm of torque and a 499cc unit with 27.2 BHP of peak output and 41.3 Nm of torque. Both engines are likely to be paired with a 5-speed transmission.